Top pick for the heavy duty truck segment is the 2017 Ram 3500. With its comfortable ride quality, refined interior, and incredible hauling capabilities you can’t go wrong with this vehicle. If your towing and hauling needs have not been met by its smaller sibling the Ram 2500, the Ram 3500 is the go-to workhorse to provide you with the additional needed muscle to get the job done. The Ram 3500 could very well be one of the hardest working trucks around due to its enormous 31,210 lb. towing capacity. A 5.7L V8 that produces 383 horsepower and a 6.4L V8 with 410 horsepower and when equipped in the Mega Cab produces 370 horsepower are the gasoline engine choices. For a diesel option, this vehicle is equipped with the famous 6.7L Cummins inline-six turbo diesel. Depending on the selection of transmission this vehicle can produce anywhere from 350 horsepower all the way to 385 horsepower. The 3500 can be equipped with as little or as many accessories as you need, from the Tradesman edition to the fully equipped Longhorn Limited. In this segment, there are only a few competitors and none of them feature the Ram’s best options. Optional is a rear air suspension system that features automatic load leveling that compensates for heavy loads to provide excellent ride quality. The 2017 Ram 3500 is for sale now near Oklahoma City, Warr Acres, Moore, and Edmond, OK. Same as the other leading heavy duty trucks in its class, the Ram 3500 is available in many different trim packages. There are six trim levels, three engine options, two transmissions, two bed lengths, and three different cab styles. The trim packages available start with the sparse Tradesman, SLT, Big Horn, Laramie, Laramie Longhorn, and the most luxurious model the Limited. The three available cab styles available are the extra-large four-door known as the Mega Cab, the regular Crew Cab, and a two-door Regular Cab. The Mega Cab is a little special. It is equipped with the same wheelbase as the long bed crew cab so it comes with a large size cab and exclusive to the Mega Cab is a shorter bed size. 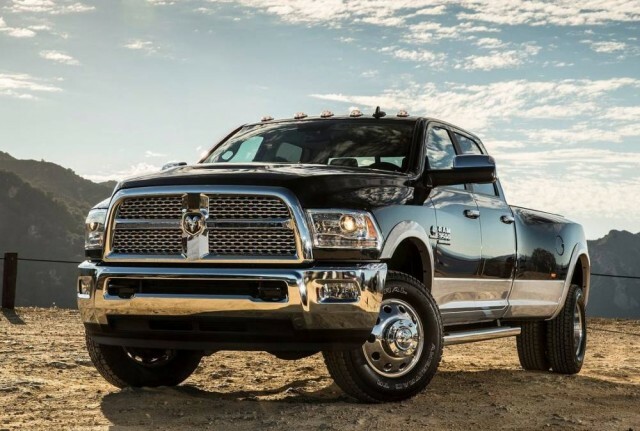 Factory equipped, the Ram 3500 comes with a 5.7 L V8 Hemi engine that produces 383 horsepower and 400 lb-ft of torque paired to an automatic six-speed transmission. For fleet users and those with special requirements this engine also comes in a CNG (Compressed Natural Gas) version that still produces the same power as the gasoline engine. The Ram 3500 can be equipped with either a part time 4WD driveline or rear wheel drive. If more power is what owners are looking for there are two optional engines available. The 6.4L V8 engine is paired to the automatic six-speed transmission and produces 410 horsepower and 429 lb-ft of torque. For extreme uses, this vehicle can also be equipped with the 6.7L diesel engine. When matched to the optional Aisin transmission this engine produces 385 horsepower and 900 lb-ft of torque, The factory six-speed transmission sees those numbers change to 370 horsepower and 800 lb-ft, and if the driver chooses the six-speed manual transmission those numbers are derated even more to only 350 horsepower and 660 lb-ft of torque. SLT and the Tradesman trim packages are available in three cab styles. The Big Horn, Laramie, Laramie Longhorn and Limited packages only come with the selection of Mega Cab or Crew Cab styles. The Tradesman is the lowest trim package available for the Ram 3500. It comes nicely equipped with 17” wheels, locking tailgate, automatic headlights, black grille, black bumper, and a 40/20/40 bench seat. Also included is a stereo system with six speakers, USB port, and an aux radio input jack. Power locks and windows, as well as power heated mirrors, are included from the factory on crew cab models. Regular cabs, however, come with non-heated mirrors and manual controls. Geared toward commercial and fleet use, the Tradesman can be ordered with upgraded heavy duty Work Grade vinyl upholstery. The SLT package gets 18” steel wheels, factory trailer brake controller, power heated mirrors, keyless entry, chrome exterior trim and overhead console. It also comes with cloth upholstery, power accessories, carpeted floors, and a 5” touchscreen that includes Satellite radio with Bluetooth audio and phone connectivity. The Big Horn (also known as the Lone Star in Texas) includes a limited slip rear differential, chrome grill, remote start, and 18” alloy wheels. Inside it adds a ten-way power adjustable driver seat with premium cloth upholstery, audio controls, and a leather-wrapped steering wheel. The Laramie includes the 6.4L V8 as factory equipment as well as more chrome trim, two-tone paint, LED taillights, front and rear park-assist sensors, and projector headlights. It also includes dual-zone automatic climate control, driver side seat memory, heated and ventilated seats, heated steering wheel, ten-speaker audio system and for the passenger, a six-way power adjustable seat. Ram dropped the limited slip differential as factory but still includes it on its option list. Adding to the Laramie is the Laramie Longhorn. This package adds cream colored bumpers, running boards, chrome mesh grill, spray in bedliner, remote start, upgraded leather, wood interior trim, power adjustable pedals, a navigation system, rear heated seats, and a full center console. The most luxurious package is the Limited. This package builds on the wonderful features of the other models but adds 20” alloy wheels, more chrome trim, automatic high beams, keyless entry and keyless ignition system, color matched bumpers, and a special black leather interior. Also included is Ram’s exclusive RamBox system, this is a cargo management system that had bedside compartments and adjustable cargo tie-downs to provide the ultimate in cargo management. Upper trim package features are also available for the lower trim levels as optional. These optional features include a cargo view camera, fifth wheel trailer prep, CD player, off-road tires and automatic load leveling suspension. All trim packages come from the factory as rear-wheel drive. A two-speed transfer case with low range gearing provides an optional four-wheel drive system if required. A manual transfer case comes equipped in the Tradesman while all other trim levels feature an electronic transfer case. Three powertrain options are available for the 2017 Ram 3500. The historic Hemi 5.7L engine is paired to a six-speed automatic transmission and produces 383 horsepower and 440 lb-ft of torque. The Hemi is famous for its long-term reliability and power and is equipped with a deep skirted block with aluminum cylinder heads. To provide customers with a larger engine, designers came out with the 6.4L version of the famous Hemi engine. This engine features a cylinder deactivation system known as MDS which depending on driving conditions deactivate four cylinders. This provides an increase in fuel economy. To enhance durability this engine comes equipped with cross-bolted main bearing caps and a deep skirt iron block. Known in the automotive community as an engine that can frequently surpass 500,000 kilometers, the Cummins engine line never disappoints. Engineers had to equip this engine with the Aisin automatic transmission so it could handle the amazing 900 lb-ft of torque and 385 horsepower that this engine can produce. With a 5 year, 160,000-km powertrain warranty and oil change intervals that can last as long as 24,000 km this engine can easily lower your operating costs. The Ram 3500 comes equipped with a Class V hitch that can handle 18,000 lbs. If maximum towing capacity is what you are looking for when trailering with a 5th wheel or gooseneck hitch this vehicle can tow 31,210 lbs. To aid in towing safety it also comes equipped with an Electronic Stability Control system with Trailer Sway Control and four- and seven-pin trailer connectors. Payload capacity maxes out at 7,390 lbs. depending on configuration and a maximum GCWR of 39,100 lbs. is available as well. The 2017 Ram 3500 has an award-winning Uconnect infotainment system that is very user-friendly. Even though it’s a 3500 truck the cab is airy, open and due to the fact it doesn’t sit very far from the ground, it is easy to see out. When it comes to luxury the Ram 3500 could compete with any vehicle out there, truck or sedan. Narrow A Pillars make it easy to see out and all windows are very large for maximum sight. Rear parking sensors are optional and the optional rearview camera is a good choice. Paint quality is excellent as well as the fit and finish of all exterior gaps. Many safety features come standard on the 2017 Ram 3500. They include stability control, traction control, ABS brakes, and front side-mounted airbags. In the Mega Cab and Crew Cab trim packages rear curtain airbags come standard as well as a post-collision safety system. The 2017 Ram 3500 is available for sale in Oklahoma City, near The Village, Del City, and Bethany OK.